NOTICE: Activation key must be used on a valid Steam account. Requires internet connection. About the gameMars has been colonized and has invited you to lend a hand to make sure the new colony has a shot at success. But you're not the only one that's been invited, other business rivals are here as well and they have no qualms about playing dirty to gain the choicest territories on the Martian… surface and driving their competitors out of business. Key FeaturesVenture to Mars to Earn Your Fortune With space travel becoming a reality and the easy-to-reach resources on Earth dwindling, hopeful people seeking their fortune are rushing to the next great frontier: Mars. Rekindle humanity’s adventurous spirit by leaving Earth behind and make a new name for yourself as a titan of industry on the red planet.Discover the Origin of the Major Martian Businesses Determine the fate of the Martian colonization effort in the dynamic single-player campaign mode. Multiple types of CEOs, each with unique traits and abilities, deliver many hours of discovery into their motivations and how they intend to dominate the future of Mars. Experience New Adventure in Multiplayer Turn your friends into frenemies! With a robust and exciting multiplayer mode that can support up to eight players, no two games of Offworld Trading Company are the same! The market fluctuates depending on which of the four starting corporations you and your opponents choose and what resources you accumulate. Strategy is key, and tenuous alliances between rivals are easily broken when the opportunity arises. Control the Market before your Competition Controls You In Offworld Trading Company, market forces are your weapons, not guns or bombs. The real-time player driven market is your sword and your shield here. In order to win, you will need to make tough choices on what resources to acquire, what goods to build and sell, how to interact with the planet's thriving underworld, and what stocks to acquire and when. With over a dozen different resources available and a constantly changing market economy, no two paths of victory are alike -- each game holds a different “key” to dominating your competition.Enjoy a Rich Soundtrack from a Grammy Award Winning Composer Transport yourself to Mars and immerse yourself in the battle for big business with an incredible soundtrack from composer Christopher Tin (Baba Yetu, Civilization IV). This retro-futuristic score mixes orchestra instrumentals, piano, and synthesizers while utilizing unique pitch-dives and other electronic treatments. All of these unique elements gives Offworld a truly otherworldly tone. Check out the full interview here: http://www.mohawkgames.com/2016/04/26/christopher-tin-goes-offworld/ System Requirements Windows - Minimum Operating system: Windows 10 / 8.1 / 7 Processor: 1.8 GHz Intel Core 2 Duo / 2.0 GHz AMD Athlon X2 64 Memory: 2 GB Hard disk space: 2 GB Video: Nvidia GeForce 8800 GT / ATI Radeon HD 3870 / Intel HD Graphics 4600 Sound: DirectX Compatible Sound Card DirectX®: 11 Other: Broadband Internet for Multiplayer Windows - Recommended Processor: 3 GHz Intel Quad-Core Processor / 3.2 GHz AMD Six-Core Processor Memory: 4 GB Hard disk space: 2 GB Video: Nvidia GeForce GTX 460 / AMD Radeon HD 7850 Mac - Minimum Operating system: OS X Yosemite or Better Processor: 1.4 GHz Intel Core i5 Memory: 4 GB Hard disk space: 2 GB Video: Nvidia GeForce 8800 GT / ATI Radeon HD 3870 / Intel HD Graphics 4600 Other: Broadband Internet for Multiplayer Mac - Recommended Processor: 2.6 GHz Intel Core i5 Memory: 8 GB Hard disk space: 2 GB Video: Intel Iris Graphics or Better Copyright © 2016 Mohawk Games and Stardock Entertainment. 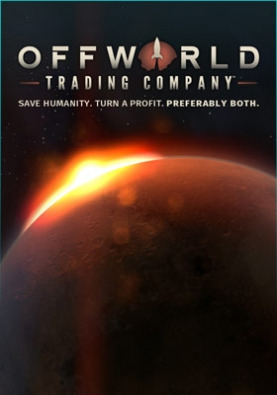 Offworld Trading Company is a trademark of Mohawk Games. All rights reserved.